USAIN Bolt doesn't really do low-key on the track. But the world's fastest man left the Moscow night sky to provide the fireworks for the 100m final at the world championships, while he did what he does best, running faster than anyone else and racking up gold medals. Others may have baulked at the lightning and rain that greeted the 100m final, but Bolt seemed to find it merely amusing. He played up to a less than capacity crowd at Moscow's Luzhniki Stadium by feigning to put up an umbrella when he was introduced. But he needed no shelter. Bolt's ability to relax under extreme pressure, including recent doping scandals, is one of the attributes that has separated him from all rivals over the past five years. "I'm not acting, that's my personality," he said later. "It's fun. Actually, from the semis I didn't feel 100 per cent, my legs felt sore. But I was never worried." With 30m to go Bolt staged his customary late surge to steam past eventual silver medallist Justin Gatlin, stopping the clock in 9.77sec, despite the wet track and a slight headwind. It was his season's best and the second-fastest time of the year, behind Tyson Gay's 9.75 to win the US title before he was suspended for failing a drug test, but also his slowest to win a major title. Gatlin ran 9.85 and a second Jamaican Nesta Carter claimed bronze in 9.95. With this run, Bolt erased the memory of his disqualification from the 100m final in Daegu, the only blemish in an extraordinary career. At 26, he has six Olympic gold medals and six world titles (100m, 200m and 4x100m relay) with with his favourite event, the 200m, and the relay still to come. It always seemed as if this world title was only on loan to his young training partner Yohan Blake, who was the silver medallist behind him at last year's Olympics, and now it is back in his keeping. Bolt has until Friday's 200m heats to rest his weary legs and it will depend on how they respond as to how he approaches the event. He is likely to complete the sprint double without strain. Bolt had promised to produce "something special" in Moscow to make up for the black eye the sport received last month when it was revealed that two of his chief rivals, former world champion Gay and former world record-holder Asafa Powell, had returned positive tests, but the inclement weather did not assist his cause in the 100m. "I'm happy. 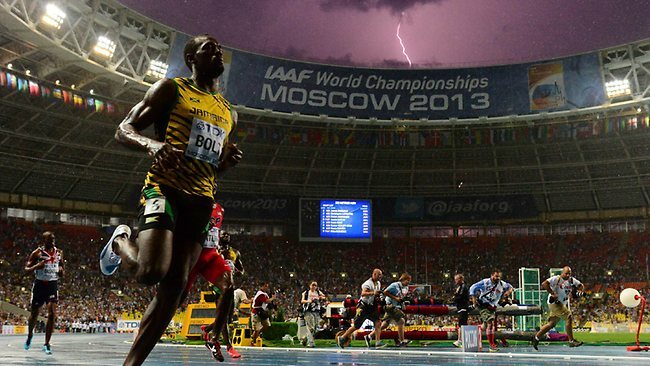 I came with one aim -- to regain my title, and I did that so it's good," Bolt said. "I get my joy from making my own goals and I continue to make new ones." He also wants to "distract people away from the bad things in the sport" which he does as long as he keeps passing drug tests. Even with the recent doping scandal in its ranks, Jamaica again confirmed its place as the world's sprinting powerhouse, claiming four of the top five positions. Kemar Bailey-Cole was fourth (9.98) in a photo-finish from his teammate Nickel Ashmeade (also given 9.98). The relay gold medal also seems assured.